Our winners of the Platfom X completion recently enjoyed a day at Newcastle Central Station as part of their prize. They learnt all about jobs within the railway industry and even had the opportunity to see the new trains that are about to come into operation in the new year. 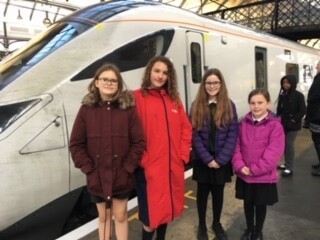 This picture shows the girls standing in front of one of the new trains whilst it was passing through Newcastle as part of its test run. A massive well done to Rose, Izzy, Grace and Chloe for winning the competition!